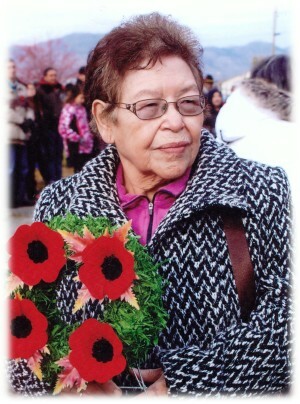 Victoria Cardinal passed away with her family by her side at Overlander Care Centre in Kamloops, BC, on June 19, 2015. She was 89 years of age. Formerly a longtime resident of Clearwater, BC, for the past several years Vicki lived in St. Paul, Alberta. Born Eva Victoria Jackson in Goodfish, AB on October 29, 1925 to parents Thomas and Irene, Vicki is survived by her children Cliff (Linda), Larson (Sharon), Irene (Merv), Brian (Bea), Wayne (Evelyn) and Tim; by her 19 grandchildren and 14 great grandchildren, and by numerous nieces and nephews. She was predeceased by her parents Irene and Thomas Jackson, her husband Don Cardinal, son Arnold, sisters Rena, Lorraine and Clara, and by her brother Alex. Vicki was a loving wife and mother. Family was the most important thing to her. She was a generous and caring person. So sorry to hear of the loss of such a kind lady. Condolences to Tim and Family.